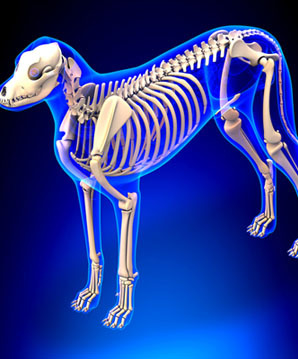 Often referred to as the wear & tear disease or degenerative joint disease (DJD) in dogs, arthritis occurs when the hyaline cartilage at the end of bones which forms a joint is gradually worn away. The cartilage is a shock absorber and also holds important lubrication for the joint, its function being to provide frictionless motion to prevent bones from directly contacting each other. Over time this cartilage can begin to dry out, stiffen, become inflamed and wear away so doesn’t provide the amount of cushioning it once did. This can lead to the bones eventually grating together which causes further inflammation in addition to the production of osteophytes which begin to remodel the bone, making it rough and misshapen thus inhibiting the natural range of the joint. This places further stress on the supporting muscles which are responsible for slinging over the joint to produce movement. The muscles will begin to protective splint and accrue massive stresses causing myofascial pain and trigger points. Arthritis can occur due to activity, conformation, breed predisposition, and is generally considered a sign of ageing joints and a normal part of the ageing process in senior dogs. However, younger dogs can be prone to arthritis if they have another pre-existing orthopaedic condition such as hip dysplasia or OCD. Arthritis is typically seen as pain, inflammation to the joint and swelling. These are the most common causes of arthritis although a poor diet and a stressed immune system can also contribute. 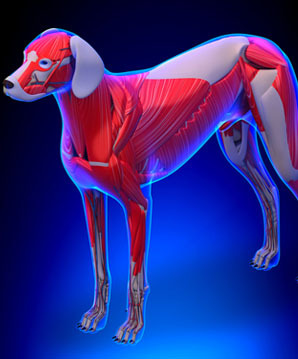 The use of the Therapist’s knowledge on the muscular system including origins, insertions and actions of muscles. The appropriate use of a suitable massage modality to be able to correctly address the soft tissue imbalance e.g. sports massage for injury rehabilitation, myofascial release for protective muscle splinting and trigger point release. It can help to relax hypertonic musculature – these are muscles which seem to bulge even when the dog is relaxing, the dog may feel quite tight or may show signs of discomfort when being petted or groomed in an area. Using appropriate non-invasive techniques massage may help to address muscles that have become fixed into a habitual pattern which is in turn causing pain and inhibiting movement. 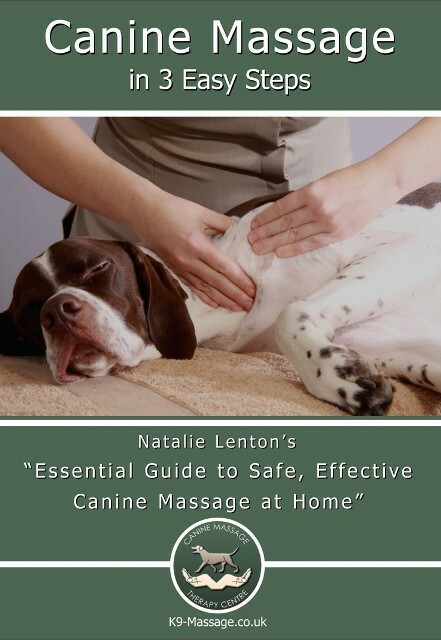 A skilled Canine Massage Therapist can directly loosen and lengthen muscles that have been held into a fixed position over time to give the muscle back its ability to relax and contract efficiently. The benefit? A more active, looser, freer and mobile dog. They are usually happier for it too. The therapist should also be able to identify patterns of overcompensation and pain referral at secondary sites too which can happen all over the body. For example in the human a common complaint with lower back sufferers is they also get muscular neck pain. This would also be true in the case of the dog. 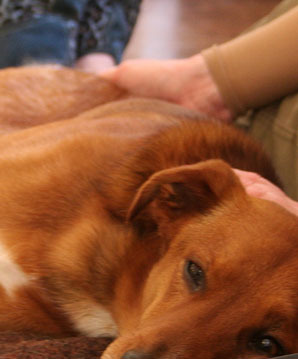 Therefore a thorough massage should always address the dog’s whole body. 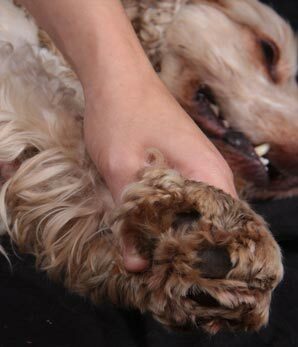 Therapeutic Massage helps to address areas of protective muscle splinting and in turn significantly reduce the dog’s pain. This is because due to increased pressure on the arthritic joint the muscles crossing the joint become stressed, shortened and inflexible. And when massage is applied correctly the issues in these muscles are addressed rather than masked resulting in an improvement in their range of motion, movement and gait, and a happier demeanour.